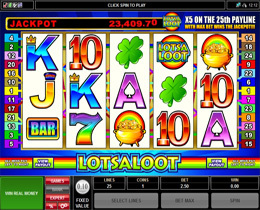 Lots a Loot 5 reel Progressive slot is just as popular as the 3 reel slot, especially since they are linked for a combined progressive jackpot. The origins are related and make use of Poker hands and the high valued symbols of playing cards, such as Ace, King, Queen, Jack and Ten. Players will be paid out on the type of symbol combination and no per Poker hands.